Enjoy precision highlighting thanks to a see-through tip and slender grip. Know exactly when to stop highlighting with the help of a see through tip and slim grip. 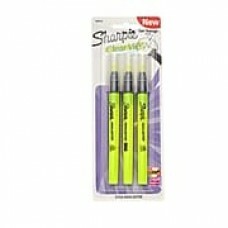 The Sharpie® Clear View® Highlighter Stick features a transparent tip and slender barrel that makes it easy to precisely highlight text. Smear Guard® ink (let ink dry before highlighting). Control meets accuracy with the Sharpie Clear View Stick. ry before highlighting). Control meets accuracy with the Sharpie Clear View Stick.